I love baking soda. Whenever I stock up, I buy a lot of boxes. It's not that baking soda can clean everything, but it can definitely make almost everything cleaner. Check out these places around your home that could use a little baking soda. You may have seen the volcano science experiment for what happens when you pour vinegar onto baking soda. Beyond entertaining you, however, baking soda can make a huge difference in the smell and the efficiency of your drains. Try adding baking soda under hot running water to freshen the drain. Baking soda can even be used in combination with hot water to unclog a drain. It's probably not a surprise to you that adding baking soda to a load of laundry can help freshen and brighten clothing. But baking soda can go beyond that when used in your washing machine. Baking soda can make a great fabric softener when added to the wash. Or try using baking soda to neutralize odorous spills. Baking soda is also a great tool to clean your washing machine. If the most you've ever done with baking soda in your refrigerator was to open a box and leave it in there, you might be missing out on some of the best benefits of using baking soda in the fridge. Try sprinkling baking soda in the bottom of your crisper drawer. Baking soda can also be used to remove stains in a refrigerator. This came in quite handy when someone spilled maraschino cherry juice in the bottom of the fridge at our house. We went from pink to pure white with a little baking soda. Pots and pans are my nemesis in the kitchen. And if you have nice pots and pans, you want to be gentle enough with them to keep them looking nice but tough enough to remove baked on food. Try using baking soda with enamel and copper pans. If you have a stained pan, baking soda does a fantastic job at removing or at least reducing the visibility of stains. Nonstick pans that tend to absorb the odor of the food that they cook could also benefit from a baking soda soak. Baking soda is a great tool to use when cleaning a microwave because it tackles grease, odors, and stuck on particles of food. In addition to this baking soda can remove oily and tomato based stains. Baking soda does wonders on the inside of the microwave and you won't have to worry about chemical residue. Baking soda is by far the simplest oven cleaner I have found. Baking soda can tackle tough stains in your oven as well as stuck on grease and residual odors. Baking soda is simple to use. Make sure your oven is completely cooled down before spreading a layer of baking soda in the bottom. I like to use a water bottle to spray the baking soda until it is damp but not saturated. Repeat every few hours and watch as the particles of food in your oven begin to dissolve. We spend a lot of money on dishwasher detergent in an attempt to get our dishes clean. 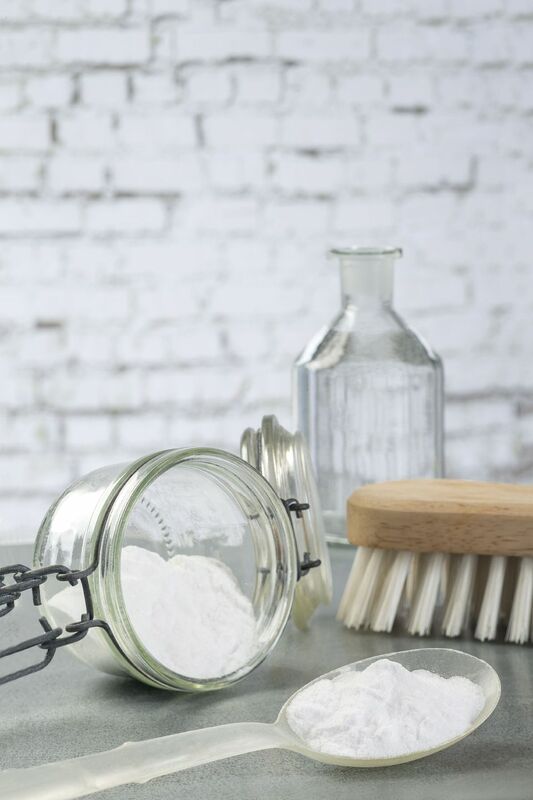 Baking soda with a little Borax makes an inexpensive and highly effective homemade dishwashing detergent. What's more, adding a little baking soda to the rinse cycle of your dishwasher can help freshen the machine and remove grime and dirt inside. Got trash? Chances are you do. Baking soda can help keep the trash smell from overpowering your home. It can be as simple as sprinkling baking soda in the bottom of the trash can, or directly into the trash sack. Baking soda also can be the perfect cleaner to scrub your trash can, helping to remove odors, freshen, and clean.